As far as I know, there are only a few Besançon-style decks on the market. I’ll start my survey with the most affordable and accessible deck, a re-creation by Evalyne Hall. While translating the writings of Antoine Court de Gebelin and the Comte de Mellet (18th century French authors who were the first to link Tarot and Kaballah), she realized de Mellet used a Besançon deck. Since she didn’t have access to this type of deck, she created her own by lovingly re-drawing historic cards that reside in Paris in the Bibliothèque Nationale. What is a Besançon deck? 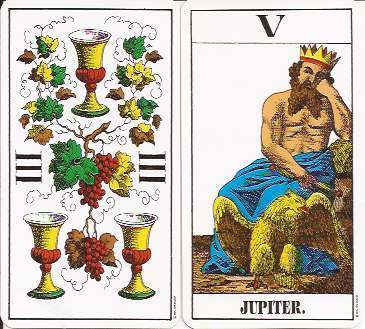 It’s a traditional Tarot de Marseille with Jupiter and Juno substituting for the Papesse and Pope. Besançon was just one of several cities where the deck was manufactured, but this name stuck to the style. The story has been that the religious figures on a pack of playing cards offended Catholics, so card makers were required to put something else on the deck. Actually, the altered deck proliferated in the predominantly Protestant areas of eastern France, southwestern Germany and Switzerland. Evidently Protestants didn’t enjoy looking at iconic Catholic figures while playing cards. Hall’s deck is based on an original by F. J. Jerger printed in Besançon about 1800. Il Meneghello has produced a deck that’s almost identical to Jerger’s, a facsimile of a deck printed by Benois of Strasbourg. 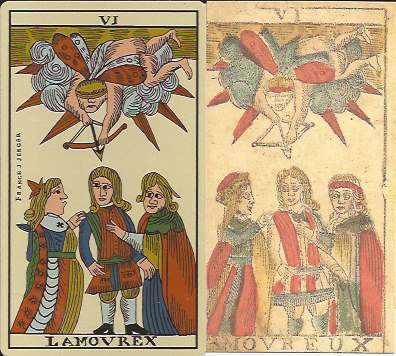 You can see the difference between the decks in the two Jupiter cards shown above and the Lovers. Since Il Meneghello’s deck is a photo-facsimile, we see the deck in its current condition with faded lines where the woodblock was worn. The original stenciled colors fall outside the lines and sometimes are unevenly applied. The paper is heavy, untreated card stock. Hall’s deck is printed on smooth playing card stock with crisp lines and rich colors, since it’s a contemporary re-drawing. The faces on both decks are rather odd, ranging from lumpy to badly distorted, with melancholy or sly expressions. Another deck of this type on the market is US Games Swiss 1JJ which launched Stuart Kaplan as a tarot entrepreneur. It’s based on a style made popular by J. G. Rauch in Switzerland in the mid 1800s, one of the predecessors of the AGMuller company. This deck strays from TdM imagery and is obviously meant to be decorative rather than traditional. Another Besançon deck just hit the streets. It’s a rather quirky German deck printed in Salzburg about 1780. The facsimile is produced by Giordano Berti. Here’s a link to my review with a link to Berti’s website. Tarocco di Besançon. Il Meneghello, Milan, 2000. Edition of 1,000. A new to me Tarot style – Besancon. Quite interesting!